“Buyagift invite you to join them for a day of true driving adrenaline. 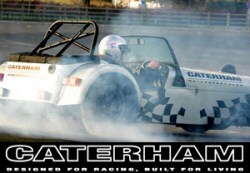 The nimble Caterham is guaranteed to deliver the most fun you’ve had on four wheels! Go wild in one of these amazing two seaters at the world famous Silverstone track. You’ll slip, slide and spin as you race the clock and perfect your driving techniques. As the day progresses you’ll have the chance to tackle faster and more demanding circuits – just to keep you on your toes! Well, if that doesn’t get you excited then we have to wonder why you are actually reading a website on driving experiences! Living in the North West and with an early time to meet at Silverstone I thought it best to make my way down to Silverstone the night before so not having to get up a ridiculous hour in the morning. I had booked myself into a B&B that said it was just 600 meters from the main entrance of Silverstone, what I didn’t realise is that that was as the crow flies and it was a few miles to actually get there by road, fortunately the B&B owners gave us a lift into the middle of the circuit where the main meeting point is. I met someone else I knew there and we were then escorted over to the Caterham section in the middle of the track, none of the people we saw there were people we recognised but we continued to wait and even have the safety briefing. There was also by the looks of it a drive a Ferrari experience taking place that day too so we got to have a quick look at a few of those parked up. It was only after half an hour when people were getting their helmets that we realised we were at the wrong part of the track, a quick phone call and we were picked up and taken to the car-park right next to the Silverstone entrance that had a few faces we recognised. So, we then took in our second safety briefing of the day and were given our timetable of what we would be doing. It was a nice day, just warm enough to be able to wear a t-shirt so that made a welcome bonus! There was 3 Caterham cars that were there and a course set out with small plastic cones that we would soon be slipping and sliding through. There was an electronic timer that was positioned with electronic beams that started and stopped the clock when you finished your run, so you got a precise timing for each drive you did. The day was split up with a new course and each driver would have their best time for each course totaled so at the end of the day the over all fastest drivers would receive a trophy and the honors for the day! Before each new circuit throughout the day we stood and watched one of the instructors drive the circuit so we knew where to head and what to do! It should be pointed out that the tyres and suspension on the Caterhams had been messed about with to make them as slippery and slidy as possible, they would not normally be quite as “loose” as these were. This is good though as it made it easier to get the car to do the naughty things we wanted it to do…! Everyones names were added to a white board so we knew what our running order would be, we then were able to keep track of driver changes so the day ran smoothly. You would get your helmet about 5 minutes before it was your go and then you would be ready to jump straight into the Caterham when it was your go. 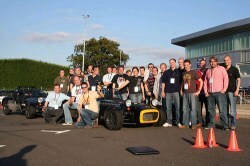 This ran very smoothly and the three Caterham cars were constantly being driven! Each course that we had to do was progressively different than the last to help you slowly learn and master different driving techniques and to make sure you could get the most out of the car. The first course required weaving in and out of a set of cones set up in a line and then driving through 2 far gates and back to a large bollard. Round this you then had to perform a donut without touching the bollard or you received a time penalty. You will great great amusement and laugh at when it comes to watching everyone on the donuts and throughout the whole day that was the part that everyone watching was focussed on seeing if you would crack it or not. Doing the donuts is a skill that needs practice, some mastered it and some struggled. It is a case of setting the car up in the correct position and then getting your throttle and clutch balance right so that you could keep the rear wheels spinning you round as the front ones guide you round the cone. Too much power and you spin right out, not enough and you won’t get a spin on, it is a right challenge but great fun. After that it’s into the “stop” area where you will stop the clock and then be back into the pits for your second run and then a driver change. Your best run would be used for your running “time” score. While you were waiting for your go there was a refreshments room where you could get a drink and something to eat while you then carried on watching or chatting with the other drivers there. A quick change round and the circuit was changed again, this time with a couple of zigzag slalom gates where you can to slide the car round about 120 degrees between these cones to be pointing towards the next gate, again it ended with the donut where you could try and work on your original attempts to see if you could improve. I think it is worth writing about the instructors and the guys who actually run the day (about 3 middle aged guys, and 1 young guy and a young lady), they were absolutely superb. They were constantly cracking jokes and knew everyones names when it came to your turn. They also offered hints and tips when you came to start your next drive, saying which bits you got right and suggestions on how you could improve and get the most fun out of the day. The day really geared towards having fun and despite safety being the most important part the instructors made it so enjoyable that you always had a smile on your face (well, other than if you got a bit of a slapped wrist for maybe being slightly naughty…I will expand more on that a bit later)! When dinnertime came a buffet type spread was supplied for everyone to munch on, plenty to go round to fill everyone up. We were told we wouldn’t start the afternoons driving until we had eaten all the food that had been laid on, as much as an incentive it was for everyone to make sure it was all eaten up there was still some scran that been left. After dinner it was time to hear what our placings were, this is when I realised that our times for each run were actually being added together and it was actually important to knock up a good time in each run. Without sounding like I’m getting my excuses ready but I, despite being a very competitive person, had been having a laugh and maybe enjoyed sliding the car slightly more than I should so my time wasn’t towards the fastest, plus the fact I got some time penalties for hitting the cone on my donuts didn’t help I guess, that said I know it was the same for everyone so will just accept to not being the best there on the day! The run down of our placings drew comments from the instructors at those who may have stood out for one reason or another, all good fun and kept the feeling of the day fun and jovial, yet with a hint of competitiveness to it! The afternoon session included another 3 different courses for us to complete, following the same format as before, we had the added incentive that if we were quick and did our change over quickly we might be able to all get an extra run in at the end of the day. Now everyone else loved it, the instructors didn’t. Obviously from a safety aspect had the rear wheels gripped and shot me forward into the pit area it could potentially have been dangerous (it was all under control really). I got a bit of a talking to and was give the first warning of the day, I am pleased to say I was later joined by one other person who also got a warning later on in the day, that made me feel slightly less naughty! When it came to the final run of the day, we had been given our placings and the timings for first place were split but just a second, so for those at the top of the list there was all to play for. With my messing around and acceptance that I’d put myself out of the running at the start of the day when I had not put in great times I had carried on just having fun and not hugely worrying about the times. I’d settled to enjoy doing longer powerslides round the cones and controlling them than worrying about the times I was getting. Anyway, final run of the day and I decided to go for it, just to show that I could do it if I tried, I did it amazing and the only problem being I caught the bollard on the donut which ruined my time, the biggest problem was that it got caught up against the front suspension arms and in a desperate attempt to still finish quick I drove with the bollard up against the front suspension, that got me my second telling off of the day and probably resulted in the slowest time too, gutted. The top 3 people were presented with trophies to take away. We all had a group photo around the cars and then that was it for the day. I have done a few driving experiences, single seaters, rally driving (rally driving at Silverstone), driving supercars such as getting to drive a Ferrari and Lamborghinis which are great fun, but obviously with a supercar that costs hundreds of thousands of pounds also comes slightly more restrictions, yes you get to give them a drive and put your foot down but all with an instructor sat with you. 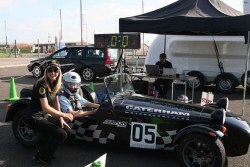 The Caterham experience was totally different, you were in the car on your own an were actively encouraged to drive in a fashion you would not usually be able to drive, sliding the car and doing donuts. It was absolutely brilliant fun and I didn’t lose the smile on my face all day, I don’t think anyone did. The moto of the day was “Drive it like you stole it”, and that sums it up really well, pure fun and extreme driving that leaves you with a huge grin! You just need to compose yourself before you leave though, you need to remember when you get behind the wheel of your own car that you need to put your sensible hat back on! 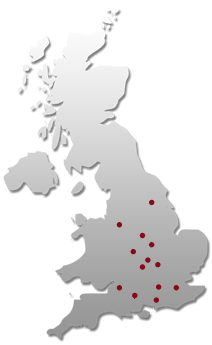 Have you been on a driving experience gift day and fancy doing a write up about how you found it and your thoughts on it?